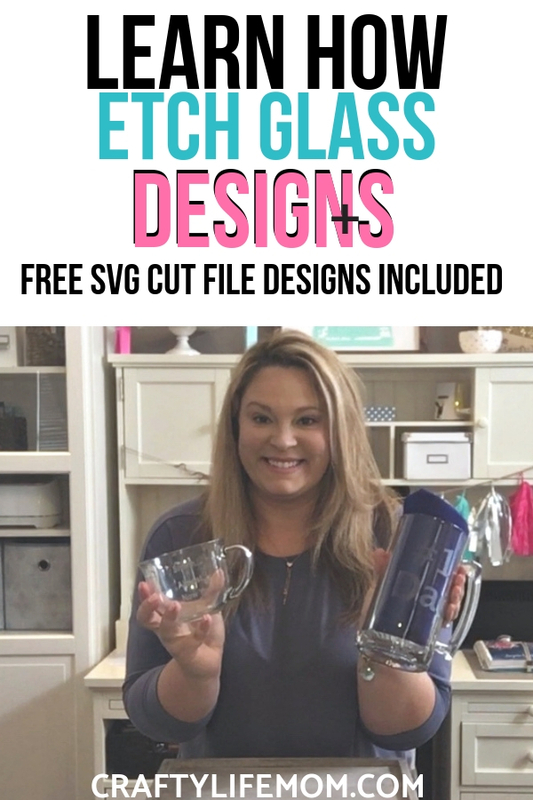 Learn how to etch glass objects using your Cricut or Silhouette craft cutting machine and adhesive vinyl along with glass etching cream to create designs in glass. Download the glass etch designs from this tutorial to create your own glass etched objects and gifts. 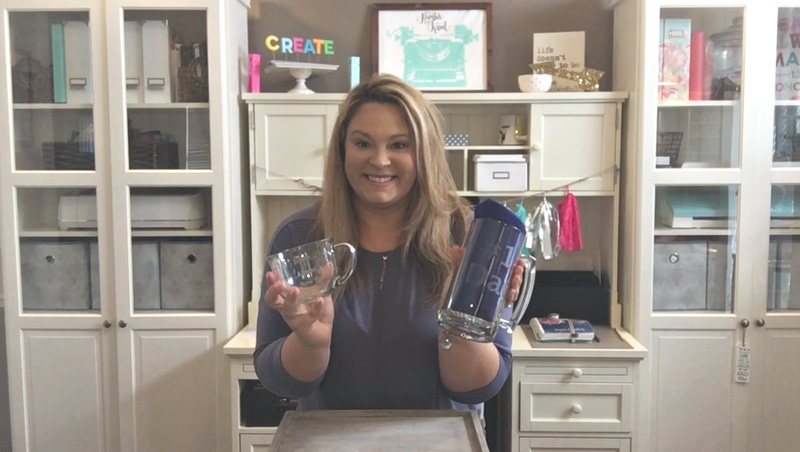 Glass etched items such as mugs, glasses, beer steins, bowls, dishes and more are great items to personalize and give as gifts or even sell in small handmade craft businesses. 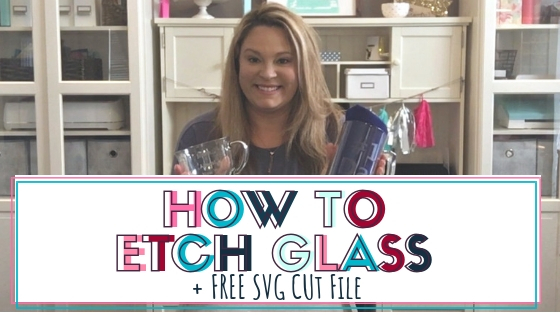 Follow this easy tutorial to learn how to make your glass etched designs. This post contains some affiliate links for your convenience (which means if you make a purchase after clicking a link I will earn a small commission but it is at no additional cost to you)! Read my full disclosure here. You may be wondering what glass etching is and what it is used for. Simply put, glass etching is abrading or roughing up of glass in a particular design or in areas that create a design. Glass etching is permanent meaning that you cannot remove the design once it has been etched. 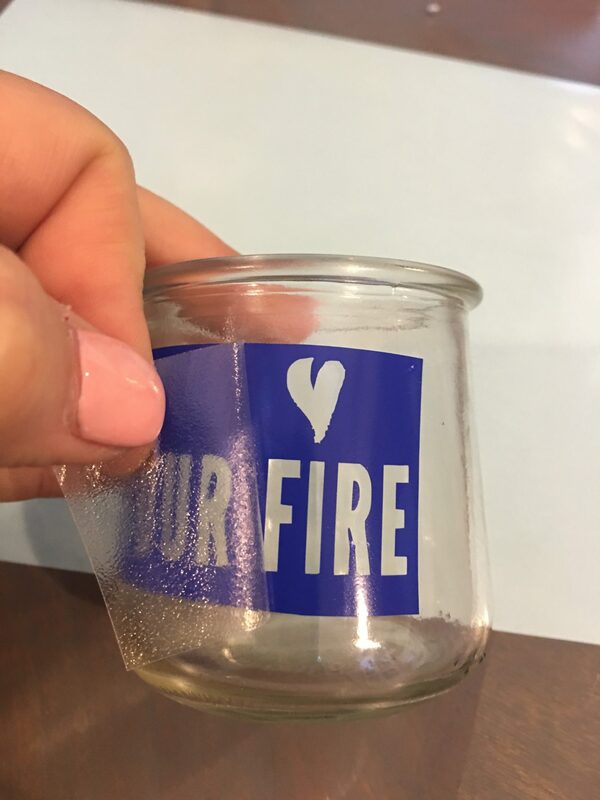 Adhesive vinyl on a glass cup or mug can be removed, but the etching of glass is permanent. Glass etching creams are made up of acids or chemicals that burn away the glass where selected. 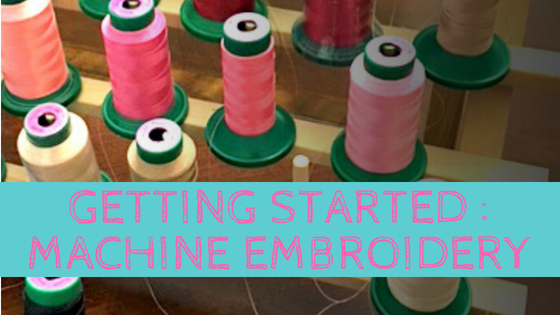 In order to create your own glass etched items, you will need to first gather your supplies. I have created a list of materials and supplies in order to create one to two items. Glass object: Glass Mug or cup. You can find several glass objects at the Dollar Tree. Adhesive Vinyl: large scraps work great if you have small areas to etch. 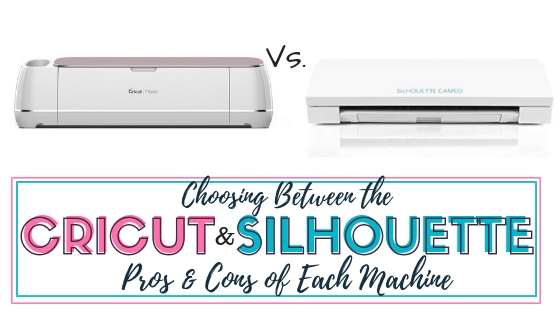 Craft Cutting Machine: To cut out your design stencil. 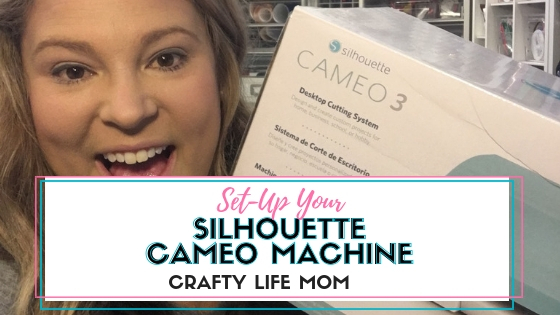 Cricut or Silhouette work great! Glass Etching Cream: This is the magic stuff! 10oz (a pretty good amount) runs around $16-$18. Other Materials: paint or foam brush, gloves, and transfer tape. Once you have gathered all of your supplies, find a clear space or area to work. 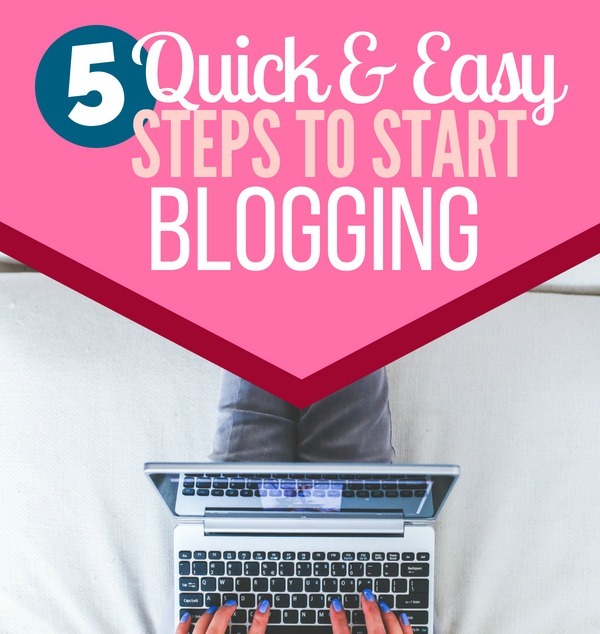 Lay out everything you need to complete the project. You want to make sure your glass objects are clean. Rinse them and make sure they are free from any dust particles or residue from labels or stickers that may have been on them when you bought them. Download the glass etch designs from The Resource Library or use your own. 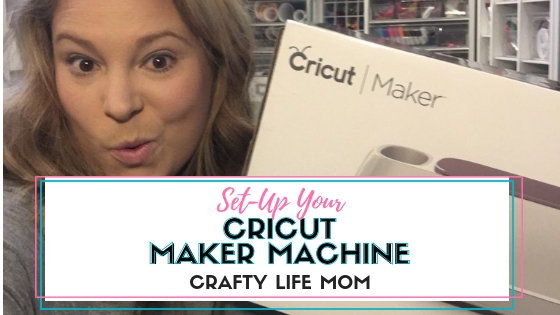 Next, upload the design into your Cricut Design Space software or Silhouette Studio software. 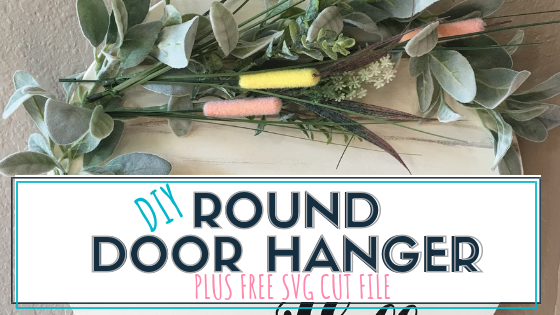 Load the adhesive vinyl onto your cutting mat and cut the design out. You will need to weed the design in the negative form creating a stencil. When you weed the design, it is important to weed in such a way that it actually becomes a stencil and not a decal. You will be applying the vinyl to the glass, however, only as a stencil which will then be removed. So make sure you weed out the letter, not the vinyl around the letter. Leave any vinyl that is the center space. For example, the letter O is removed but leave the round circle middle piece. You will want the etching cream to be applied around this area so the O is defined, and not just a round circle or dot. 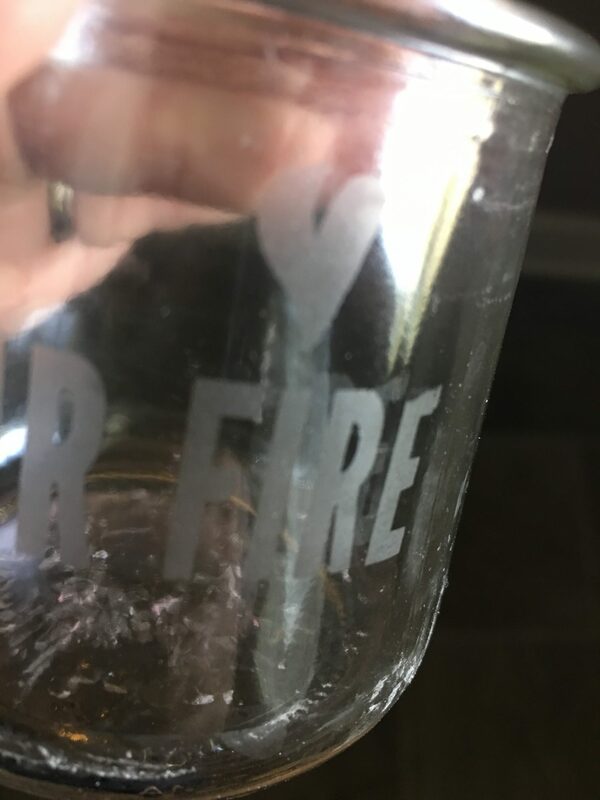 After your design is properly weeded, you will need to use your transfer tape to transfer the vinyl stencil to the glass object you chose to be etched. Using gloves, apply the etching cream with a foam brush or paint brush. The glass etching cream is an acid chemical that can burn your skin. Use safety first, and just wear the gloves to avoid any chemical burns or possible irritations to your skin or worse face and eyes. Apply and even yet the generous amount of glass etch cream to the stencil. Allow the cream to work its magic for about 5-7 minutes. Note* The glass etch cream I used stated that it could be applied only 1-3 minutes before rinsing. I discovered the that the thicker the glass, the longer I needed to let it sit. For this, you will want to use your judgment for the item you choose to etch. 1-3 minutes longer will not hurt. Just do not leave it on so long that the cream burns through the glass. Rinse the etching cream away and remove your vinyl. The glass etching design should be revealed on your glass object in a frost slightly indented design to the touch. You can glass etch many items and create gifts for others. I have even seen where some have etched the under glass areas of casserole dishes. I think this is a pretty need because as the food is eaten, the casserole dish owner or baker is revealed. What do you think? 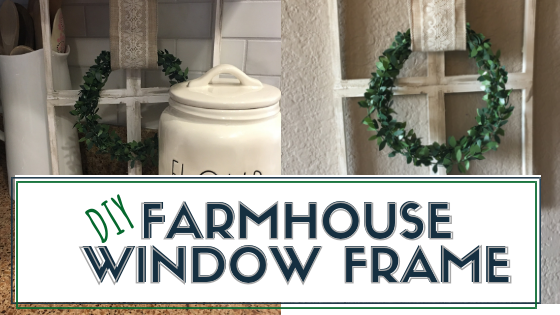 Do you love this craft project DIY? I created a video of the glass etching process. Check it out below. 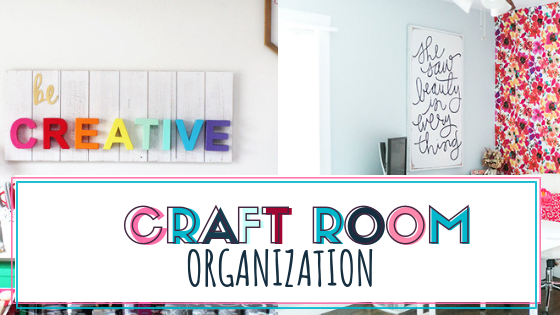 Want to Join the Crafty Life Mom Community and download this SVG FREE?